Don't Let Sensitive Teeth Slow You Down During the Holidays! Don’t Let Sensitive Teeth Slow You Down During the Holidays! Do you suffer from sensitive teeth? Does the thought of ice cold water make you cringe? Do sweets give you a twinge? If you have sensitive teeth, this blog is for you! There are several different causes of tooth sensitivity. Listed below are the most common ones. The most common cause of sensitive teeth is untreated cavities. Cavities penetrate the hard outer shell of enamel on a tooth, allowing bacteria to work its way toward the nerve inside. They also allow certain sensations like hot, cold, and sweets to reach the nerve. If you have sensitive teeth, the most important thing to do is rule out cavities by having a dental check-up with x-rays. Are you overdue? Call us today to schedule an evaluation ASAP so we can help you enjoy your holiday eating and drinking without tooth sensitivity! A crack in a tooth allows those sensations to reach the nerve in the same way that a cavity does. The hard shell of enamel is no longer intact and therefore cannot protect the nerve from the normal temperatures of food and drinks. Cracks are a little more complicated than cavities because they are more difficult to see. A cracked tooth will typically be tender to biting or chewing in addition to temperature sensitivity. Another very common cause of tooth sensitivity is receding gums. The roots of teeth do not have the protective covering of enamel because bone and gums should cover them. When the gums recede, the vulnerable root surface is exposed to the oral environment. The sensations of hot, cold and sweets can easily reach the internal nerve from the root surface. Many people suffer from sensitive teeth even though they do not have cavities, cracked teeth or gum recession. Another cause of tooth sensitivity is heavy clenching and/or grinding forces. Most often, the grinding causes a wearing away of the enamel on the biting surface of the teeth. Enamel that is thin or completely worn away does not adequately protect the nerve from extreme temperatures. In other cases, the enamel is intact, but the teeth are still sensitive. Sometimes the heavy forces produced by clenching or grinding of the teeth causes hypersensitivity of the nerves. This means that even though enamel covers and protects the teeth, the nerves are extra sensitive and over-react to “normal” temperatures. If you have sensitive teeth, you do not have to live with them! 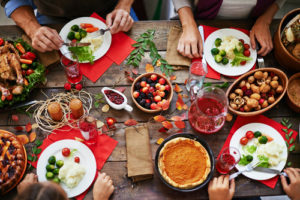 There are several steps you can take to alleviate the discomfort of hypersensitive teeth and enjoy your holiday eating and drinking. Get back on track with consistent dental cleanings and check-ups. Seeing a dentist regularly is essential to preventing and treating problems like cavities and cracks. Dr. Ann and Dr. Lauren also look for red flags or risk factors of any of the problems that could lead to sensitive teeth. Preventing cavities, cracks, gum recession, and grinding not only prevents tooth sensitivity; it can save you a ton of money over your lifetime! Follow through with any dental treatment. Unfortunately, cavities and cracked teeth will not fix themselves. And if they are causing tooth sensitivity, you can expect that things will only get worse over tie. Take care of the dental work for these sensitive teeth so you can get back to enjoying the food and drinks you love. Try over-the-counter sensitivity products. There are several oral care products available that do a great job in reducing tooth sensitivity. Sensodyne toothpaste slowly treats and prevents tooth sensitivity by adding a nerve-soothing chemical to your teeth every time you brush. Crest Sensi-Stop Strips contain a different ingredient, called oxalate, which fills in and blocks the tiny pores on tooth roots. This keeps those cold sensations from reaching the nerve. Fluoride mouthrinses, like ACT, also strengthen enamel and reduce tooth sensitivity. Use professional products recommended by Dr. Ann and Dr. Lauren. Our line of CariFree products not only helps prevent cavities. They contain two wonderful ingredients for strengthening enamel and fighting sensitivity: fluoride and nanohydroxyapatite. Anything that makes your enamel stronger fights sensitivity. We recommend a prescription strength toothpaste for some of our patients with sensitive teeth. As always, we treat each patient with regard to his or her unique situation, so not every patient will receive the same product. Protect your teeth against heavy clenching and/or grinding. This habit affects millions of Americans and causes many different dental problems. Bruxism, the technical term for clenching or grinding of the teeth, can cause tooth cracks, gum recession, enamel damage, and hypersensitive nerves. The good news is that bruxism always leaves evidence, so Dr. Ann and Dr. Lauren will tell you whether or not you are grinding your teeth. If you are, you can prevent those problems listed above by wearing a protective nightguard while you sleep. A professional nightguard is made from a hard acrylic and has a custom fit to your teeth. It puts your teeth in a certain position in order to relax your clenching muscles as you sleep. BONUS: Most people claim to sleep better when wearing their professional nightguards! Call today to schedule a consultation with Dr. Ann and Dr. Lauren. We will assess your situation and give you recommendations to ease your sensitivity and make eating and drinking fun again!